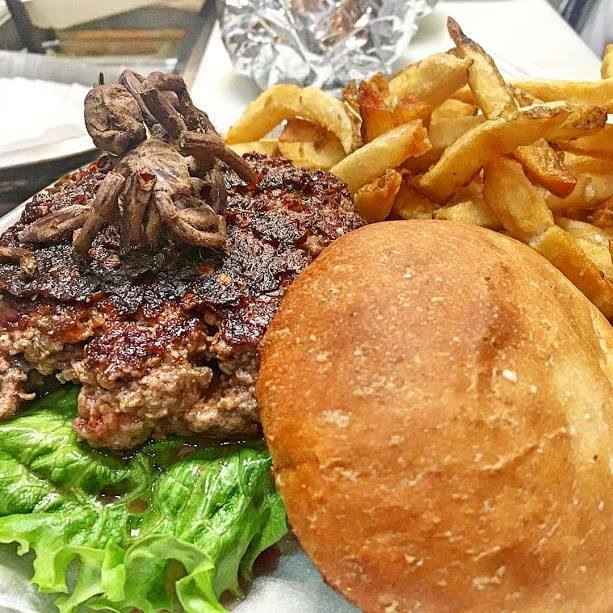 Home / #AmericanRoadRadio / #Food / #FoodStyleManiac / #TrueNews / #USChronicles / #USLocal / Lifestyle / North Carolina / #FoodStyleManiac : A North Carolina restaurant invites customers to eat a special burger with a giant tarantula roasted on the top ! #FoodStyleManiac : A North Carolina restaurant invites customers to eat a special burger with a giant tarantula roasted on the top ! A North Carolina restaurant is offering select customers the chance to eat a tarantula burger topped by a giant oven-roasted spider. Bull City Burger and Brewery announced its sixth annual Exotic Meat Month, which brought such animals as alligators, iguanas, pythons, turtles and insects to the menu, features a special tarantula challenge. The restaurant said customers can enter their names in a "tarantula raffle" to be one of the lucky few to take the "tarantula challenge." Customers whose names are drawn must watch the eatery's website, Facebook and Twitter accounts so they know when to claim their $30 tarantula burger. The winning customers must contact the restaurant to claim their burgers within 48 hours. The burger features a North Carolina pasture-raised beef patty, gruyere cheese, spicy chili sauce and an oven-roasted tarantula. Customers who finish the burgers receive "tarantula challenge" T-shirts.